The integration of Roma Ashkali Egyptian (RAE) is a challenging social issue for Kosovo. In Plementina, a small village in the Obliq municipality, a community of some 40 Kosovo RAE returnee families is facing very difficult living conditions since a fire broke out in their apartment building and made it inhabitable. Plementina, Kosovo: The integration of Roma Ashkali Egyptian (RAE) is a challenging social issue for Kosovo. In Plementina, a small village in the Obliq municipality, a community of some 40 Kosovo RAE returnee families is facing very difficult living conditions since a fire broke out in their apartment building and made it inhabitable. While they wait for the building to be repaired by the municipality and the central authorities, these families are unable to meet their daily basic needs and as a result their re-integration is severely jeopardized. Children have started school and are in need of school materials. In addition, due to the current emergency situation, income-generating activities in the community have been negatively affected. Around 30 women who used to work producing and selling accessories made of beads are now unable to purchase the materials to produce the accessories, and as a result, this income generating activity has had to stop. In response to these needs, activities were organised to support 51 children and 30 women. 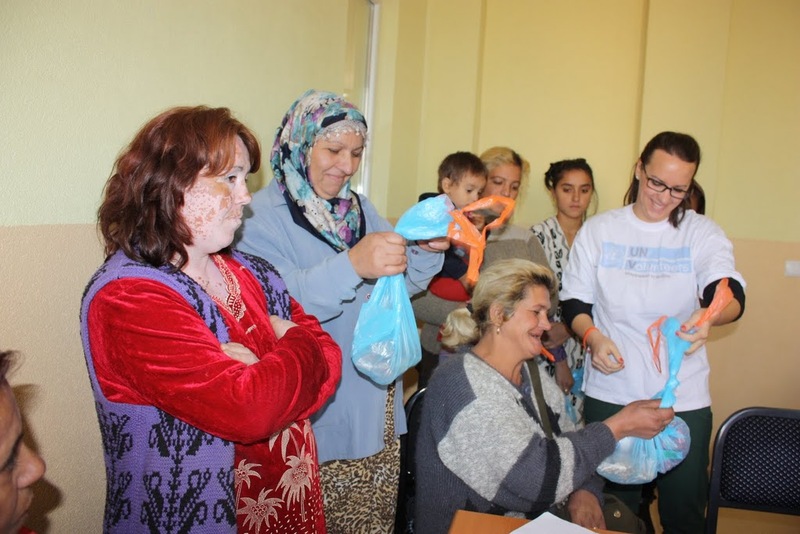 Through the UNV small grant scheme, in November four UN Volunteers organized educational activities, along with the distribution of school supplies and the delivery of materials for women at the Plementina primary school. The activities were generously supported by UNHCR, which contributed the school supplies for children, and UNDP, which contributed the materials to help the women resume their income-generating project. The implementation was coordinated and facilitated with the help of the UNHCR field officer and two local volunteers. The event was very successful and everyone had a lot of fun on the day. When we arrived at the primary school, many children, both RAE and Albanian, and invited women were waiting for us. We first had ice-breaking physical games with all the children out in the school grounds. Later, pre-school and first grade boys and girls had a creative 'Origami' activity, where they made simple but interesting hats with old newspapers. The rest of the children joined a fun educational activity using an atlas to learn geography, naming countries and capital cities in Europe. After the enthusiastic educational activities, school bags and school materials such as notebooks, pencils and crayons were distributed to the children. A few women representing the accessories project arrived to collect the materials. They proudly showed some samples of their work and said they were very happy to receive this support in order to continue with the income-generating activity of accessories and jewellery-making. We believe the supply of materials will encourage the children to continue to attend school, and support the women resume their income-generating activities.